An eating disorder took over April Lackpour’s life. Rady Children’s Medical Behavioral Unit helped her get it back. Like many young women with their sights set on college, 15-year-old April Lackpour sought to be among the most appealing applicants. She was involved in sports and was thriving in academics. She took her studies seriously and was intensely focused on training for swim team and water polo. She was striving for fitness, yet paying extreme attention to maintaining a lean figure. During the summer between her sophomore and junior years, April took part in an exchange program to Japan. There, she immersed herself in the Japanese language and culture while getting to know her host family. For the first time in her life, April was fully in control of her decisions. April severely limited her food intake, partly to assert self-control and partly to fit in with the weight-obsessed culture of high school girls. Her food deprivation quickly reached dangerous levels—she was down to around 450 calories a day, and becoming increasingly obsessed with every bite. With just one week left in the studyabroad program, April injured her hand. Her host family took her to a local doctor’s office, where she was asked to step on a scale. At 5-foot-3, she weighed barely 85 pounds. The physician, and her host family, were alarmed. “We got the call that April was down to around 85 pounds and the family was concerned,” says Doug Lackpour, April’s father. “We talked with her and she admitted there was a problem with her food intake, but she wanted to stay in Japan to finish the program. Her mother and I were skeptical because it sounded like she was no longer capable of eating on her own. We were really worried.” Fearing that if they waited any longer she would be too frail to fly, April’s parents put her on the next flight home. Back in San Diego, Doug and Melissa Lackpour were able to see just how serious their daughter’s eating disorder had become. “She would cry when food was put in front of her,” Doug says. “She knew she had to eat but couldn’t actually do it.” April was able to drink high-calorie nutritional beverages, but when faced with a slice of tomato, it took her an hour to finish. Her parents agreed. They called a residential eating disorder clinic for women, but during her preadmission screening, nurses discovered April’s heart rate was perilously low and sent her to a local emergency room. April’s high-stakes dieting had taken a dangerous toll. April was admitted to Rady Children’s Medical Behavioral Unit, the only child and adolescent medical/behavioral in patient unit in San Diego. She spent two weeks undergoing intensive psychological and nutritional counseling, along with medical and psychiatric monitoring. There is a growing understanding of the way powerful brain processes contribute to behaviors that create and sustain eating disorders. Such knowledge has resulted in eating disorders being reclassified as biologically based brain disorders. However, relatively little has been done to apply new understanding of biology to develop more effective treatment—until now. Experts at Rady Children’s Medical Behavioral Unit and the UC San Diego Eating Disorders Center for Treatment and Research use approaches based on this new knowledge—and are getting excellent results. This includes helping children and adolescents with eating disorders learn to be successful in a real-world environment by teaching them—and their families—effective support strategies. Specialized, family-based treatment emphasizes an active and positive parental role to help restore the child’s weight, hand control over eating back to the child and encourage normal development through discussion of crucial issues. As a result, patients come to the program from across the country and around the world. 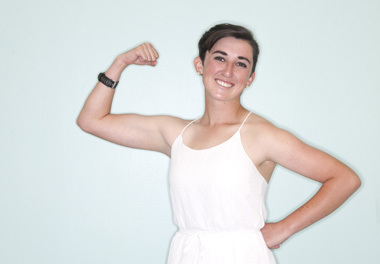 Armed with techniques for managing her eating disorder and a dedication to always improving her mental health, April, now 21, still sees a therapist for a recent diagnosis of schizoaffective disorder, a chronic mental health condition that includes symptoms of schizophrenia, such as hallucinations or delusions, and symptoms of a mood disorder, such as mania and depression. Originally published in the Summer 2018 edition of Healthy Kids Magazine.